Stepping her perfect Jimmy Choos into place beside Ben Gallagher’s wounded Nikes, straitlaced Philadelphia lawyer Catherine Barrington is surprisingly unable to resist the disarming small-town mechanic’s charm. He’s one of the heirs to the vast fortune left by his eccentric grandfather Max, a bestselling horror writer, and she’s there to carry out Max’s last wishes. Routine enough…except that inheriting comes with a catch: none of Max’s heirs will get a penny until they’ve lived together for two weeks in the shadow-filled rooms of his mansion in the wooded hills near Lake Superior. Thank you for visiting my website. 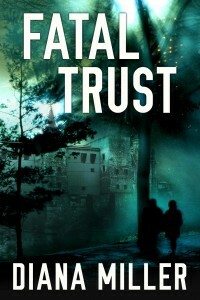 I write books where mystery, suspense, and romance collide; where danger and passion arise when you least expect it; and where trusting the wrong person can be deadly. 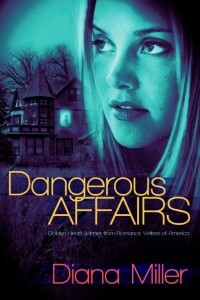 I’m thrilled to be publishing my Golden Heart® winner, DANGEROUS AFFAIRS. I hope you’ll check it out, as well as the rest of my website. 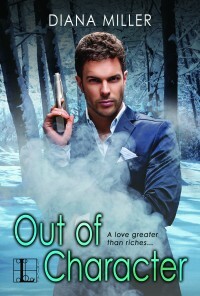 OUT OF CHARACTER is being published by Kensington! Dangerous Affairs is an Aspen Gold finalist! Dangerous Affairs is a Booksellers Best Finalist! DANGEROUS AFFAIRS IS AN AMAZON BEST SELLER! DANGEROUS AFFAIRS is a best seller in both Canada and in the UK! © 2012-2019 Diana Miller. All rights reserved.